The Goshorn Loop is located in the Thunder Trails area near Norwood, Colorado. 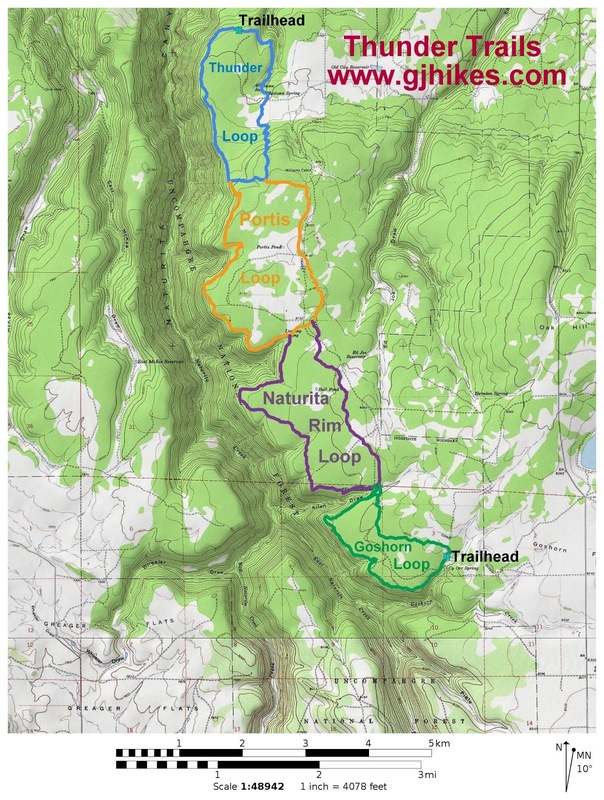 Thunder Trails is a newly created trail system in the Uncompahgre National Forest that was designed specifically for hiking, mountain biking, horseback riding and dirt biking. 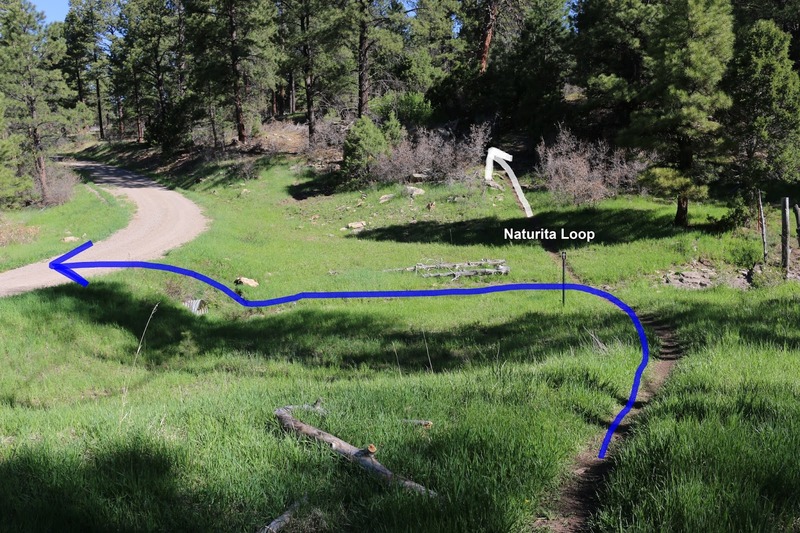 There are currently 4 trails in the system, for a total of about 19 miles, that are stretched out along Thunder Road adjacent to Naturita Canyon. For this post we began at the southernmost Thunder trailhead which is 12 miles south of Norwood. 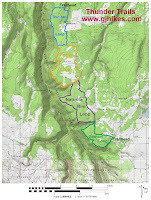 For directions and a map to the trailhead visit the Thunder Trails page. The trail starts out relatively flat along a dirt singletrack. One thing to note about the Thunder trails is that the east side of the loops tend to be smooth with not a lot of rocks. The exception is the east side of the Thunder Loop which has more hills and a few rocky areas. Travel along the east side of the Goshorn Loop is mostly easy and requires only beginner mountain bike skills. Right before the 1.4 mile point the trail gets close to Thunder Road and there is a cutoff that crosses the road and saves going all the way to the Naturita Rim Loop trail junction. Continuing to the Naturita Rim Loop junction makes it possible to follow that trail next or take a left and cross the road here. The map tends to show only one road crossing so coming upon a second one might be a little confusing at first. For this post we did both crossings so they would show up on our map and then went back to the first crossing to take pictures. If you opt for the second crossing the trail has several spots on both sides of the road that are more technical in nature where the trail climbs in and out of a wash. It is a pretty wash though so keep it in mind. The west side of the Goshorn Loop isn't quite as rough as the west side of the other 3 trails. The stretches that don't have a lot of rocks can still have a few roots and bush stubs to deal with. This is a typical rocky section where there is chunky scree on the trail. There aren't a lot of ledges to speak of though. Views to the south in places where the trees thin out and the trail comes close to the rim include Lone Cone, on the right, and peaks in the Wilson Group on the left. There are a few places where you can see down into parts of Naturita Canyon. The canyon is narrow and deep with a lot of trees on both sides so it isn't easy to see all the way down to the creek. Goshorn Loop seems to be the hands down favorite with the locals that we spoke with. One mentioned that his favorite mountain bike ride was to begin at the first trailhead, ride up the east side of each of the loops to the Goshorn trailhead, return down the east side to the Thunder Loop and take the west side of the Thunder Loop the rest of the way back to the trailhead. That would come out a little less than the 19 miles that you would otherwise have if you rode the both sides of all of the loops but it would be a lot less rocky. If you would like to see it for yourself then all you have to do is grab your bike, horse, or dirt bike and 'Take a hike'.